To prepare our gelato, we only use high quality products in order to always serve you a gelato that will meet your expectations. After more than sixty years, our recipes have remained the same to keep the natural creaminess that characterizes our gelato. 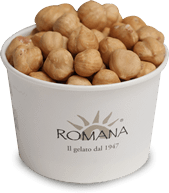 In order to always provide you with high quality genuine gelato, La Romana uses fresh organic milk from certified farms. Since 2013, many La Romana shops use eggs from land-based farms. La Romana uses only freshly whipped cream, in accordance with old recipes, to obtain a full-bodied product. La Romana has selected for you the best Italian ingredients, which have been processed using an exclusive method: “crushing”; a method in which product are crushed but not filtered, thus obtaining a taste that retains all of the fruit’s aromatic notes. Our “crushed mixtures” are made with trefoil hazelnut (product obtained exclusively from "Piedmont Hazelnut"), high quality pistachios and Avola almonds. Our fruit gelato contain a high percentage of fresh fruits, which is why we use seasonal fruits. In 2013, we created three new delicious certified organic jams (strawberry, raspberry and apricot), which we use in our pastries and to fill our crepes.